Enemac GmbH offers a new product line, the distance coupling EWLC. Even in difficult areas, such as medicine, pharma, food and beverage technology, long distant shafts have to be connected often. Distance couplings have been created in order to avoid complex and cost-intensive design work for necessary intermediate bearing arrangements. The distance coupling EWLC, with an overall length of up to 3 m, has a length-variable intermediate pipe made of stainless steel A2 or A4, which is adapted according to customers requirements. This pipe is connected with two metal bellows couplings made of stainless steel A4. 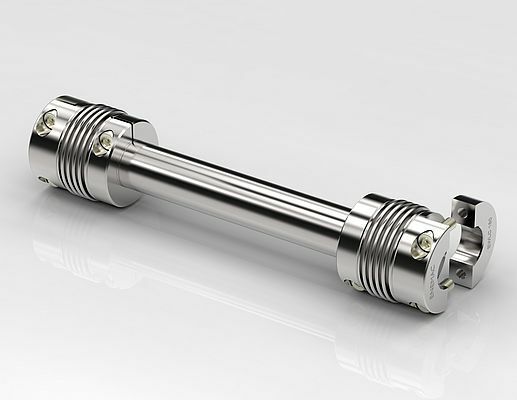 In many cases, the EWLC distance coupling can be used as a play-free connection, power train or synchronous shaft. Misalignments, in particular parallel offset, can be compensated with this type in a considerable range. The half-shell hubs facilitate the assembly and guarantee a safe, force-fitting connection. This type is extremly torsionnally stiff and is suitable for high speeds up to 6000 rpm on low moment of inertia. The EWLC is available in 7 sizes with a nominal torque of up to 1200 Nm. Bore diameters between 7 mm and 85 mm can be handeled.